If your teeth are broken, chipped, discolored, or out of alignment, porcelain veneers might be right for you. These shell coverings adhere to the surface of your tooth. As a result, they offer a long-term solution to a variety of cosmetic problems. With veneers, you can have the smile you’ve always wanted. Why settle for anything less? Porcelain veneers are a good choice for patients with healthy teeth and gums. They’re meant to correct cosmetic issues. They are not appropriate for patients with tooth decay or gum disease. If you’re struggling with those issues, we’ll correct them before we pursue veneers for you. Visit our pages on Gum Care, General Dentistry, and Root Canals to learn more. 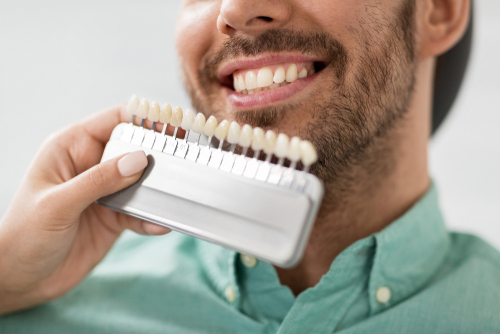 During your appointment, we’ll examine your teeth to see if veneers are right for you. 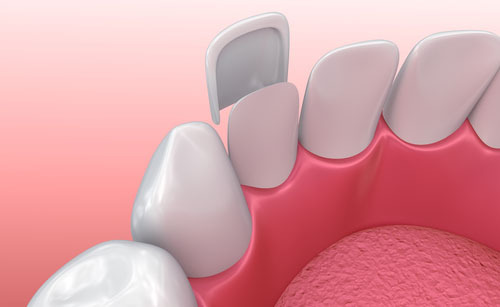 When we’re ready to put them in, we’ll first remove a small layer of enamel from your teeth. This will keep the veneers flush with your teeth. We’ll numb your mouth first to avoid any discomfort. Then we’ll take impressions of your teeth and send them to a lab. The lab will create a custom set of veneers for you. While you’re waiting for those, we’ll provide a set of temporary veneers to protect your teeth. In a few weeks, your new veneers will arrive. We’ll test them to make sure they’re a perfect fit. Then we’ll bond them to your teeth. This process is simple, and painless. You’ll leave our office feeling confident about your brand new smile. You’ll care for your new veneers in much the same way that you care for your actual teeth. Regular brushing and flossing are key. So are regular office visits so that we can examine and clean them. Maintaining good oral health is important to care for your veneers. You can also prevent damage to them by avoiding hard, sticky foods. You should also avoid biting your fingernails, or chewing on other non-food items. With proper care, your veneers can last for up to ten years or more.